Chelsea's new Russian signing Alexei Smertin has joined Portsmouth on loan for the rest of the season. Smertin - a £3.45m signing from Bordeaux - will move to Fratton Park if his work permit application is successful. The 28-year-old was due to join Torpedo Moscow earlier in August but the move fell through and Chelsea swooped to clinch a deal. These loan deals are getting a bit out of hand - Chelsea seem to have bought Pompey a player! But Chelsea coach Claudio Ranieri wants Smertin to gain more first-team experience and he has been allowed to join Harry Redknapp's Premiership newcomers. 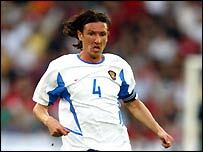 Smertin, captain of Russia, enjoyed a successful three-year spell with Bordeaux after joining the French side on a five-year contract from Lokomotiv Moscow in 2000.